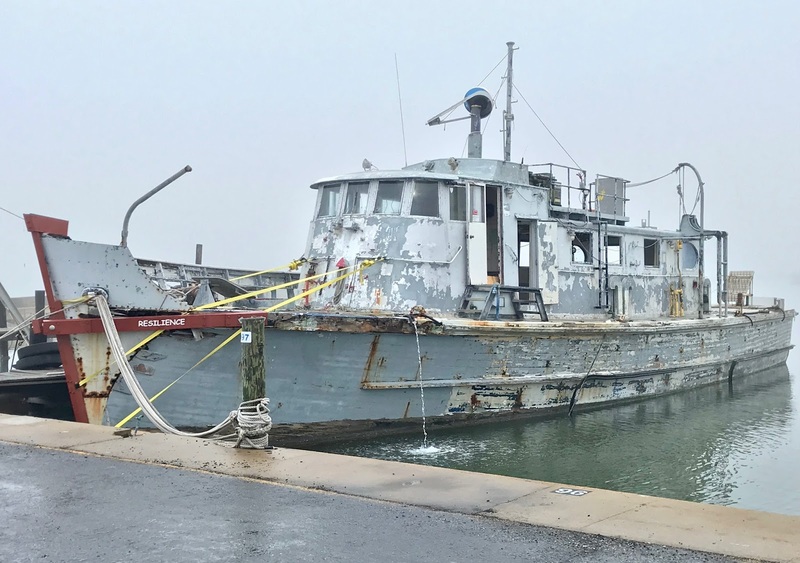 Defying predictions to the contrary, "Resilience," the Vietnam era minesweeper docked in the Rockport Harbor for the past few years, has managed to rise again. 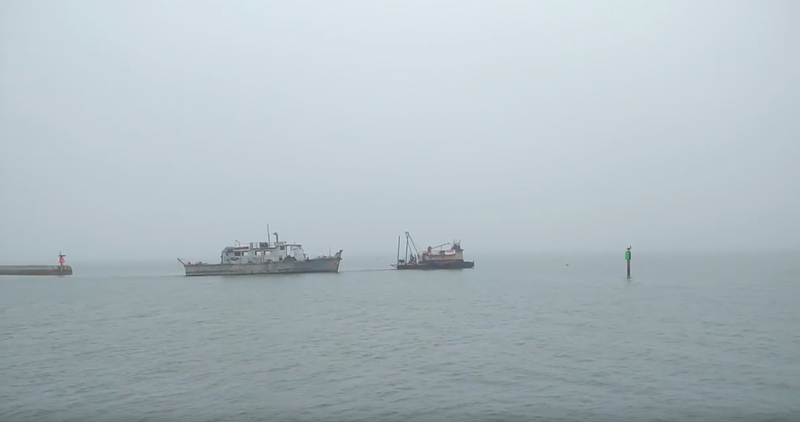 A few weeks ago, I wrote about watching the large former minesweeper as it slipped further and further into the water each day. The amount of water flowing into the leaking vessel was more than what the bilge pumps could keep up with. It looked as though its days were numbered. Miraculously, however, not only did Resilience manage to become fully upright again, last week it was towed to its new home on dry land where its owner still hopes to bring it back to life as a soup kitchen, aptly named "Resilience Kitchen." Apparently the resilient old wooden boat is still able to live up to its name. Facebook's "Resilience" page posted this shot of it being hauled to its new home. I like to think of Resilience's recovery as yet another hopeful sign that things are moving in the right direction, even though sometimes it feels as though it is at a snail's pace. 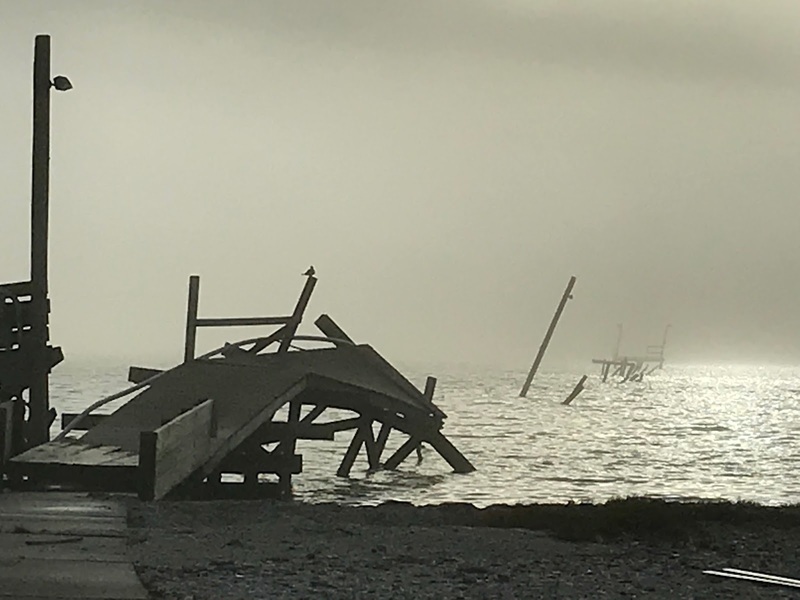 But each sign of recovery is another reminder that the most powerful hurricane ever to come upon Rockport's shores is not enough to defeat us. And I think I have discovered why. In the past few weeks I have seen it happen over and over again. And what I have observed is that our secret weapon seems to be each other coming together around something other than the hurricane. For example, last week my husband and I were in Latitudes Restaurant on the day it opened back up. At one point, all of the patrons broke out in spontaneous applause as everyone raised their glass to toast the restaurant's comeback. 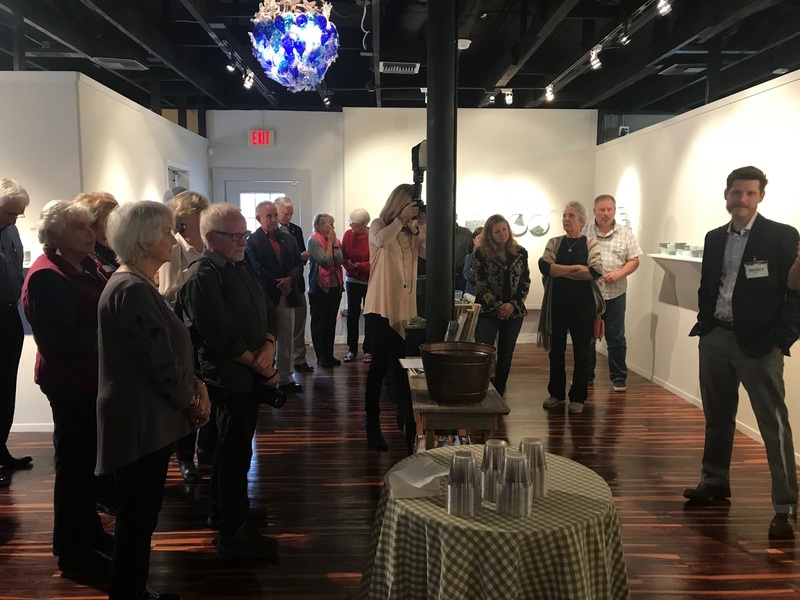 There was a festive atmosphere as people moved from table to table introducing friends to other friends and talking to their nearby neighbors. There was a palpable sense of community in the room. Another hopeful sign occurred this past weekend when I participated in Rockport's downtown cleanup. 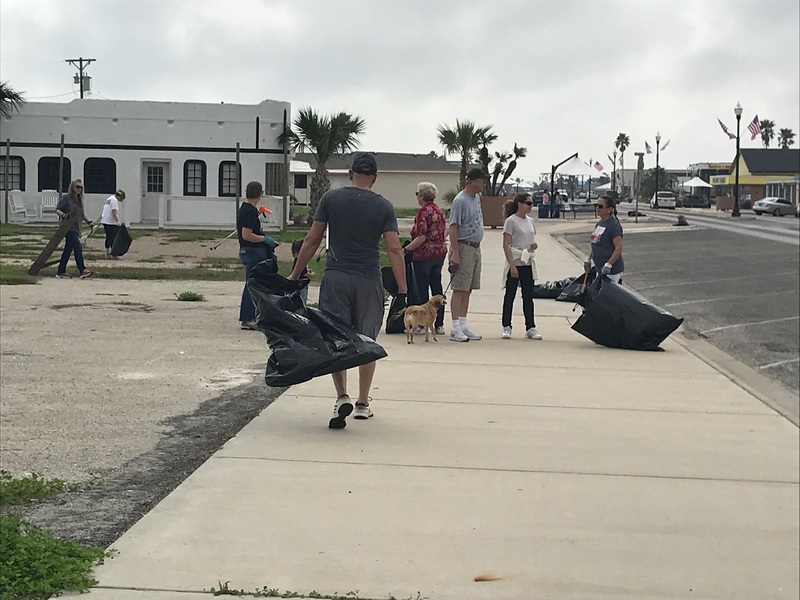 Everywhere you looked downtown were people of all ages walking around with a gripper device in one hand and a large trash bag in the other, combing the area for leftover debris from the storm. Seeing people taking time out of their own recovery efforts to do this was yet another example of people willing to come together to aid in our town's recovery. One seven year old helper happily reported to me that he had made a lot of new friends that day. Yet another reminder that our secret weapon is one another. Artist Blake Kennedy sharing reflections about his work. 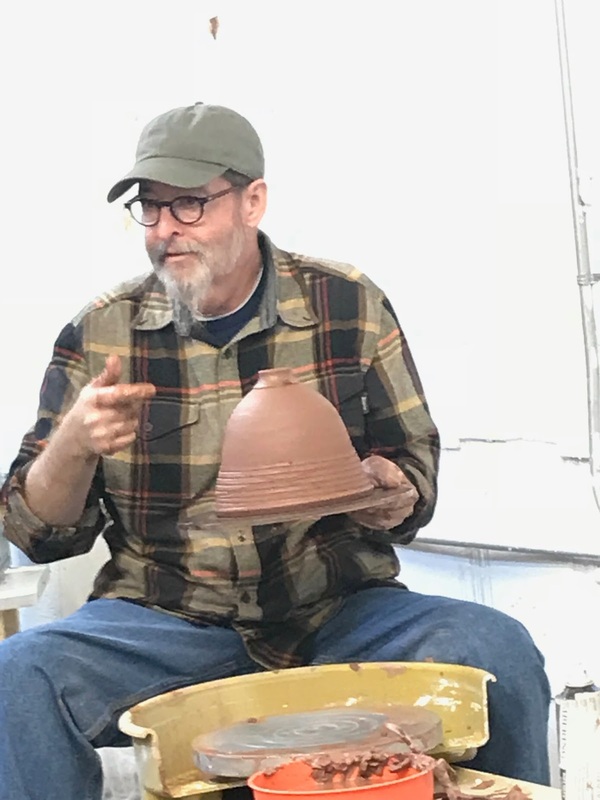 Jim Bob Salazar during a pottery demonstration at the Rockport Center for the Arts. And as we begin to find a return to normalcy, it may be important to remember to take advantage of those opportunities to come together around something other than the hurricane. We had the annual Bountiful Bowl Pottery event this month with receptions and demonstrations at the downtown galleries, and next month we all have the chance to come together at the annual Oyster Fest. Those are the kinds of things that can help us to heal and help remind us of why we live here. And, yes, it is still going to take a long time before things come completely back. But even in its current broken state, there is still beauty to be found. On my morning bike rides, I often stop along Water Street to observe the plentiful wild life and changes in the sky as the sun greets the day. Some days I look toward the water at all of the twisted wood and abruptly ending piers and all I see is destruction. But then there are days I look out and all I see is beauty. That doesn't mean there are not still days when I just want to put a for sale sign up and run away. There are more of those days than I would care to admit, but they are getting to be fewer and fewer. And maybe just as Resilience is going on to a new life, maybe Rockport also is being reborn into something even better than it was before.